The National Institute of Standards and Technology (NIST) has been pioneering antenna measurement methods for decades, but a new antenna measurement system with two robotic arms may be the ultimate innovation, extending measurements to higher frequencies while characterizing antennas faster and more easily than previous NIST facilities. NIST’s new Large Antenna Positioning System (LAPS) has two robotic arms designed to position "smart" or adaptable antennas, which can be mounted on base stations that handle signals to and from huge numbers of devices. 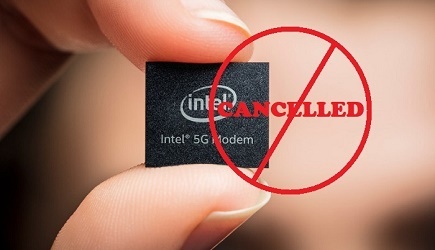 Future 5G systems will operate at higher frequencies and offer more than 100 times the data-carrying capacity of today’s cellphones, while connecting billions of mobile broadband users in complex, crowded signal environments. Among its many special capabilities, the LAPS can test transmissions to and from antennas located on fast-moving mobile devices, which requires coordination between the timing of communication signals and robot motion. NIST researchers are still validating the performance of the LAPS and are just now beginning to introduce it to industry. The system was described at a European conference last week. Today’s mobile devices such as cell phones, consumer Wi-Fi systems and public safety radios mostly operate at frequencies below 3 GHz, a crowded part of the spectrum. Next-generation mobile communications are starting to use the more open frequency bands at millimeter wavelengths (30 to 300 GHz), but these signals are easily distorted and more likely to be affected by physical barriers such as walls or buildings. Solutions will include transmitter antenna arrays with tens to hundreds of elements that focus the antenna power into a steerable beam that can track mobile devices. For decades, NIST has pioneered testing of high-end antennas for radar, aircraft, communications and satellites. Now, the LAPS will help foster the development of 5G wireless and spectrum-sharing systems. The dual-robot system will also help researchers understand the interference problems created by ever-increasing signal density. 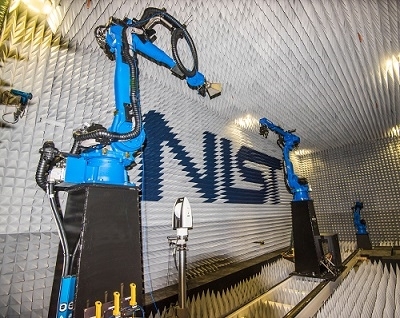 The new facility is the next generation of NIST’s Configurable Robotic Millimeter-Wave Antenna (CROMMA) Facility, which has a single robotic arm. CROMMA, developed at NIST, has become a popular tool for high-frequency antenna measurements. Companies that integrate legacy antenna measurement systems are starting to use robotic arms in their product lines, facilitating the transfer of this technology to companies like The Boeing Co.
CROMMA can measure only physically small antennas. NIST developed the LAPS concept of a dual robotic arm system, one robot in a fixed position and the other mounted on a large linear rail slide to accommodate larger antennas and base stations. The system was designed and installed by NSI-MI Technologies. The LAPS also has a safety unit, including radar designed to prevent collisions of robots and antennas within the surrounding environment, and to protect operators. The LAPS’ measurement capabilities for 5G systems include flexible scan geometries, beam tracking of mobile devices and improved accuracy and repeatability in mobile measurements. The LAPS has replaced NIST’s conventional scanners and will be used to perform near-field measurement of basic antenna properties for aerospace and satellite companies requiring precise calibrations and performance verification. The near-field technique measures the radiated signal very close to the antenna in a controlled environment and, using mathematical algorithms developed at NIST, calculates the antenna’s performance at its operating distance, known as the far field. The ultimate goal for the LAPS is to perform dynamic, over-the-air tests of future 5G communication systems. Initial validation shows that basic mechanical operation of the LAPS is within the specified design tolerances for still and moving tests to at least 30 GHz. Final validation is ongoing.